Entering the sixth and final round of the 1996 Pan-American Intercollegiate Team Chess Championship (Pan-Am) in Baltimore, with UMBC’s A and B Teams tied at five points, one point ahead of the rest of the field, a showdown between UMBC’s top two teams would determine the best college chess team in the Americas. With that dramatic unique finish—covered by CNN Headline News—UMBC’s A Team won its first Pan-Am Championship, the foremost intercollegiate team chess championship in North, Central, and South America, and the Caribbean. From 1996 to 2012, UMBC won a record six national collegiate titles and ten Pan-Am championships. UMBC is the only school to have qualified for every Final Four (top four USA schools from Pan-Am), for fifteen years from the Final Four’s inception in 2001 through 2015. Although the UMBC Chess Program is best known for winning championships, an even more important component of its activities has always been helping the community through chess. UMBC has organized summer chess camps, hosted simultaneous chess exhibitions and other special events for scholastic players, visited senior citizen centers, and assisted with chess programs at nearby schools including Arbutus Middle School. Each recipient of a chess scholarship to UMBC contributes to such community service. In this essay I will highlight some of our accomplishments, explain how college chess has evolved since 1996, and sketch my vision of where UMBC Chess is going. By December 2015, the landscape of college chess had changed. For the first time in sixteen years, UMBC failed to finish as one of the top four USA schools in the Pan-Am and thus qualify for the 2016 President’s Cup, known as the “Final Four of College Chess.” Our team placed tenth among the 42 teams from 27 schools that entered the 2015 Pan-Am, held December 27-30 in Cleveland. With 25 international grandmasters and four international woman grandmasters, it was the strongest college championship ever. It has become harder to recruit chess-player scholars. Today, at least seven schools now compete offering major chess scholarships to attract players from all over the world: UMBC, University of Texas at Dallas (UTD), Texas Tech (TT), University of Texas Rio Grande (UTRG), Webster University, Lindenwood University, and Saint Louis University. Some of these schools offer significantly more attractive recruiting packages than does UMBC. When one of our promising recruits declined our scholarship offer in favor of another school, we confronted the staggering challenge of playing with only three internationally-titled players on our four-person team. When I became Faculty Advisor of the UMBC Chess Club in 1991, UMBC had placed 26 out of the 27 teams that entered the 1990 Pan-Am. After UMBC opened in 1966, UMBC had a typical university chess club that enjoyed chess over the lunch hour, played friendly matches against Towson University, and sometimes competed in the Pan-Am. Its team was never strong until UMBC began offering chess scholarships. I took on the then seemingly impossible goal of winning the Pan-Am. UMBC 2015-2016 Chess Team. Photo by Marlayna Demond. At first, I recruited using existing academic scholarships at the undergraduate and graduate levels. I also convinced UMBC to offer each year a tuition scholarship to the top scholastic player in Maryland, and later also to the winner of the U.S. Cadet—an invitational national championship for the top ten players under sixteen years old. These scholarships continue today. UMBC established a $25,000 line item in its budget for the Chess Program, mainly for travel expenses to competitions, to simplify matters versus dealing with my ad hoc requests. Although UMBC was not the first university to offer chess scholarships, it was the first university to do so in a sustained major way, and it paid off. A colorful array of formidable players has fought for the UMBC Retrievers, including GM Ilya Smirin (ranked 16th in world), Alexander “The Invincible” Onischuk (former US Champion), Pawel “The Polish Magician” Blehm (former Captain, World Junior Team), Battsetseg “The Mongolian Terror” Tsagaan (a top woman from Mongolia), and William “The Exterminator” Morrison (former Maryland Champion). Monikers became one of our signature traditions. Realizing that their future lay in other areas, these amazing players leveraged their chess accomplishments to compete for UMBC while earning a university degree. In 2002, UMBC established four Chess Fellow awards comprising tuition and a $15,000 food and housing stipend, later increasing the number to five. Support for these awards has come largely from external funds. Each fellow is required to contribute 100 hours per year of community service through chess. Additionally, I was able to raise some funds for UMBC Chess through grants (including from the Abell Foundation and the Maryland Department of Education); private and corporate donations; and entrepreneurial activities including running chess camps and a Master Preparation chess course, and making instructional chess videos. Following UMBC’s model and improving upon it, three Texas schools entered the fray—UTD, TT, and UTRG (then Brownsville). Some institutions have a full-time director, coach, and scholastic outreach coordinator. In 2012, most of the TT team and its coach Grandmaster Susan Polgar (former woman’s world champion) defected to Webster’s highly funded program, winning three national titles. With the support of billionaire Rex Sinquefield, St. Louis is recruiting aggressively with the aim of winning the 2016 Pan-Am. Meanwhile, despite inflation, the UMBC chess budget and fellow awards have seen no increase since 2002. In a surprising upset, TT tied for first place at the 2015 Pan-Am with Webster’s B Team, UTRG, and Columbia University. Webster’s A Team, with an astronomically high average rating of 2747, did not make the winner’s circle. As sometimes happens due to the peculiarities of Swiss-System pairings, Columbia slid into the Final Four, displacing a much stronger UTD team, by facing only one extremely strong opponent, while UTD and UMBC played two. Some people criticize schools for “buying a winning chess team.” I, however, see nothing wrong with investing in intellectual athletes, provided they are also outstanding students who embody our values. I also find it appropriate and beneficial to invest in infrastructure to support community outreach through chess and other intellectual sports, which outreach is part of UMBC’s core mission. 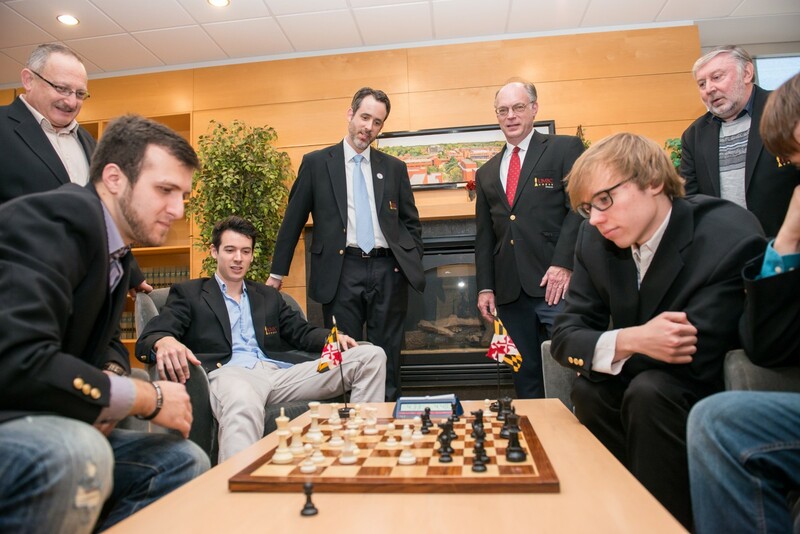 The primary mission of the UMBC Chess Program has never been about winning championships but rather about helping the community through chess and enriching the university experience of students. The UMBC Chess Program has also recruited outstanding chess-player scholars to UMBC (many of our players are straight-A students), and it has given UMBC an international spotlight as an innovative university that values activities of the mind. It is also true that our winning team was vital to much of our media attention, which has included front-page stories in the Washington Post, Wall Street Journal, and Philadelphia Inquirer, and appearances on ABC Good Morning America, CNN Headline News, NPR, and BBC Radio, to name just a few. The media attention helped UMBC gain name recognition and it contributed to the increasing number and quality of applicants to UMBC. This academic year, we participated in Howard County’s Math Festival and hosted chess events and teach-ins with students from the Johns Hopkins Center for Talented Youth, Holy Cross Elementary School, and UMBC’s College of Mathematics and Natural Sciences. UMBC President Freeman Hrabowski III frequently boasts about UMBC Chess, and for his strong unwavering support, I am deeply grateful. Also contributing to our accomplishments are the countless hours spent by our dedicated part-time staff, including International Grandmaster and former Spartak Champion of the Soviet Union Sam Palatnik from Odessa, Ukraine (A Team Coach); National Master and former coach of the Junior Belarussian Team Igor Epshteyn from Minsk (B Team Coach); and Joel DeWyer from Naples, Florida (Business Manager). Our Chess Club is part of a group of student organizations comprising go, debate, mock trial, moot court, ethics bowl, model UN, model African union, speech, robotics, and destination imagination. At one time, this group was formally organized as the UMBC Council of Intellectual Sports, which enjoyed a friendly relationship with the UMBC Honors College. UMBC created this council in part as a result of my seeking a home for UMBC Chess. After debating with then Director of Athletics Charlie Brown whether or not chess is a sport, I concluded that it would be best for UMBC Chess to exist outside of the Athletics Department. While Chess Team members feel disappointed that UMBC does not fund its Chess Program as strongly as do the other major chess schools, other intellectual sports teams at UMBC feel disappointed that UMBC Chess receives significant funding while they receive none. Currently, the UMBC administration has no plan to increase support for UMBC Chess. Instead, one idea is to establish a full-time position to support all of the intellectual sports, especially for community outreach. Dr. Nancy Young (VP for Student Affairs) hopes to find people of passion who can make great things happen without significant financial support. But no amount of passion can make a national master beat an international grandmaster, and it takes a full-time coordinator, not just talk, to organize our talent to make a significant impact in helping Baltimore youth and senior citizens through chess. At one time, UMBC’s modest investment in chess was sufficient to win international championships. Now it is not. Unless we find a private donor, UMBC Chess will have to continue with limited support. In the coming years, I see UMBC’s Chess Program as focusing increasingly more on community outreach, continuing to recruit great students who are fine chess players, and being competitive at the second-tier collegiate level. This entry was posted in Education, Et Cetera, Features, News, People/Places. Bookmark the permalink.